With everyone clad in denim jackets, high top shoes, and high waisted jeans (and the occasional pink cowboy hat) it was hard to tell if you had time-traveled back to the 80’s or accidentally ended up at a frat party. Either way, people were flocking to Club Dada to escape the frigid weather and were gearing up for a fun night. The evening started off with the shoegaze/dream pop quartet, Pllush from San Francisco. Unfortunately, the quartet performed as a duo last night due to a sickly drummer. However, they still had the full attention of the crowd as they only played three songs. Pllush push the boundaries of the shoegaze genre with the addition of more grungy, pop-tinged vocals, that oddly enough compliment the dreamy instrumentals and give this band a unique quality that eludes many other bands in this genre. Hockey Dad @ Club Dada, Dallas, TX. Photo by Lauren Frederick. Bringing the night to a close was the energetic Southern Californian pop rock band, HUNNY. This eclectic group could have easily walked right through a portal from the 80’s with their unique style. 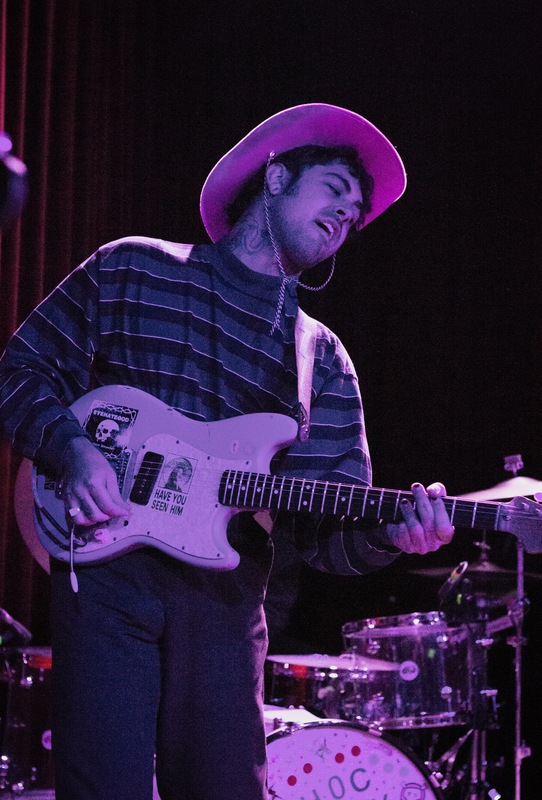 Frontman Jason Yarger was dawning a pink felt cowboy hat, joined by guitarist Jake Goldstein who was rockin the pornstache, bassist Kevin Grimmett wearing dangly dice earrings and drummer Joey Anderson with the flowing golden locks. They kicked off their set with a newer hit, “Rebel Red,” that had the crowd singing and jumping around. They kept up this energy effortlessly and had the crowd screaming along to every word as their set continued. They brought the house down as they closed out their set with two fan favorite tracks: “Vowels” and “Televised.” It won’t be long until HUNNY is a huge name in pop rock and selling out headlining tours. It is just the beginning for this eclectic bunch. HUNNY @ Club Dada, Dallas, TX. Photo by Lauren Frederick.